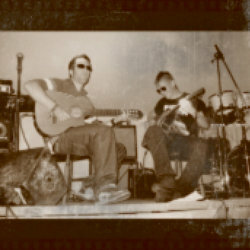 The Showhawks are acoustic guitarists Mikhail Asanovic (Lead) and Jake Wright (Rhythm). I first saw the guys perform last year doing a couple of numbers on Edinburgh Tonight with Joe Simmons and Lorraine Chase. For me, they stole the show that day. This year they have a whole show of their own for the first time at the Fringe and what a brilliant show they put on! The two guys come from contrasting guitar backgrounds, Mikhail is a classically trained with leanings towards jazz and Jake has a rock background with leanings towards heavy metal. They structured their show as a musical biography beginning with their coming together as a musical partnership. When their contrasting backgrounds are put together, they can cover a huge spectrum of music from gypsy jazz to rock classics to orchestral classics – Django Reinhardt to Jimi Hendrix to Tchaikovsky. This is only a sample what they perform. Since they are in Scotland, they have devised a combination of Celtic and Metal in one of their numbers which they term Cetal (pronounced with a hard C). Their arrangements are inventive. Their playing is fast and faultless, and really, really tight. What is immensely enjoyable about their musical style is they break down the barriers between musical genres and often with little twists of humour. A strong melody is worth celebrating whatever its origins. They mentioned they would love to return to the Fringe next year. Well, Haste Ye Back!